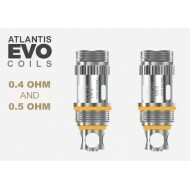 Aspire Atlantis EVO Kanthal Clapton coils. 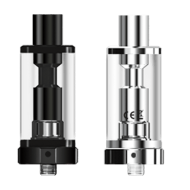 Having coil options enables the EVO to achieve your prefe.. 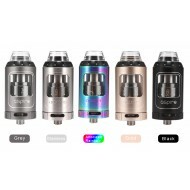 The Aspire Athos Tank is a Sub-Ohm Tank from Aspire. The new design takes inspiration from Aspire's .. 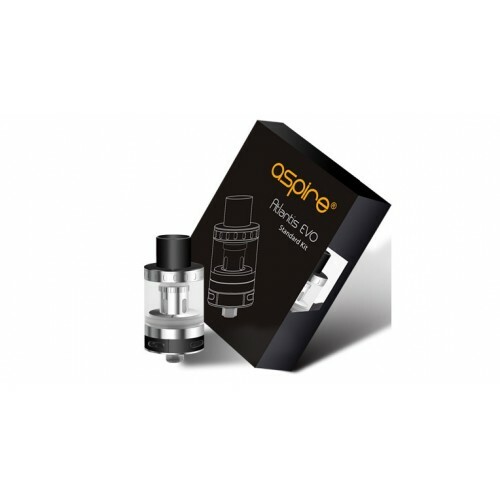 Introducing the all new Aspire Revvo tank, a truly ‘out of this world’ design with an innovative, re.. 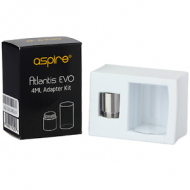 Aspire Atlantis EVO 4ml Adapter Kit comes with a 4ml Atlantis EVO pyrex glass tube and a adapter (to.. The Aspire Atlantis EVO represents the zenith of recent sub-ohm tank evolution. 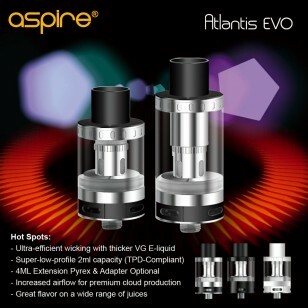 Aspire Atlantis EVO standard version features 22mm diameter and 2ml e-liquid capacity. The Double wicking efficiency teamed with lower positioned wick points creates ultra-efficient juice flow. This optimized design allows high VG E-Liquid an even faster route to the coil system. EVO breathes without a hitch when you require thick dense vapour production. Includes preinstalled 0.4 ohm coil and a 0.5ohm sub-ohm coils for an optimized vaping experience. Each Aspire Atlantis EVO comes with a cuff. 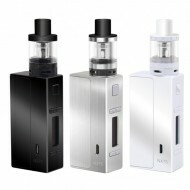 EVO cuffs are also compatible with the Aspire Cleito. These cuffs help to dissipate heat. They also allow you to colour coordinate with your mod or use them as a visual cue to remind you which E-liquid you have in your tank. The Atlantis EVO has a quick & clean top-fill tank. Refill your EVO tank in seconds. You can drip, drop or pour your E-liquid into the EVO Tank.